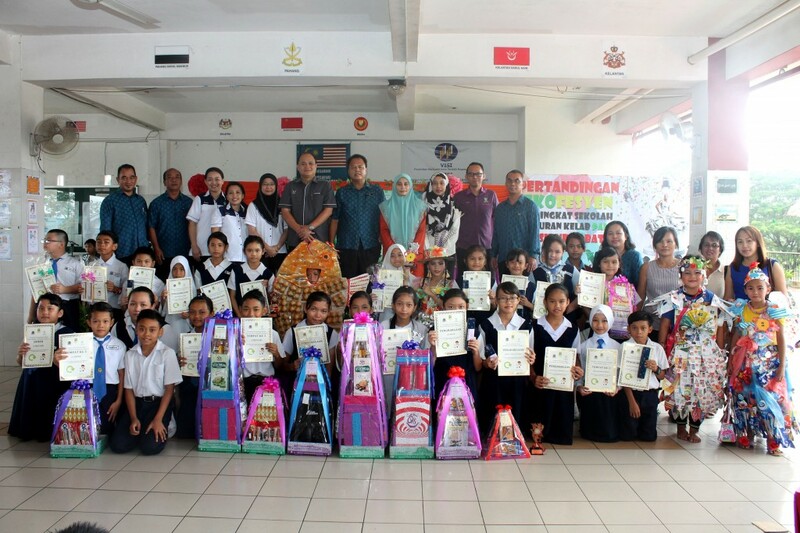 SK Siburan Batu Students Encouraged to Spread Recycling Awareness | Trienekens (Sarawak) Sdn. Bhd. KUCHING – SK Siburan Batu recently concluded the 4th year of its solid waste segregation and recycling programme with a prize presentation session organised jointly by Trienekens (Sarawak) Sdn Bhd and the Serian District Council (SDC). The programme’s objectives were to introduce the 3R (Reduce, Reuse, Recycle) concept and inculcate the habit and practice of separating solid waste at source amongst the primary school students. 3R SCHOOL…SDC Chairman Lee (6th left) flanked by Dayang Sherrynazra (5th left) and Headmaster Vinu (5th right) at the photo session with students and teachers of SK Siburan Batu. In his speech, SDC Chairman Lim Hock Meng lauded the school and Trienekens for organising the programme as it helps to promote cleanliness through the 3R concept and encouraged the community to play an active role in keeping the environment healthy and clean. Trienekens’ Division Manager for Environment Research & Development (R&D), Dayang Sherrynazra bt Awang Sharkawi said the programme is part of the company’s CSR initiative to raise better awareness about recycling, litter prevention and proper management of solid waste. Dayang also thanked SDC for their support and cooperation in the programme adding that collaboration between the private sector and local authorities in environmental programmes is much valued and welcomed as it can help raise public awareness on the importance of preserving the environment effectively and maintaining the healthy well-being of the community through proper and responsible management of solid waste. This year, the school successfully separated and recycled almost 2000kg of solid waste. In addition to the inter-class recycling competition, the students also took part in other environment-themed educational activities such as awareness talks, colouring competition and poster drawing competition. All contest winners took home exciting prizes. Also present at the event were Acting Council Secretary Rafidah Hj. Hifni, SK Siburan Batu Headmaster Vinu ak Batu and Senior Assistant (Students’ Affairs), Ilbaes ak Edem.